i put up a 4,ft folding table and got me a small table top 8,in drill. i'm still waiting for my tandy catalog they put it on a done pony hedded nort. the tandy onlie store, lizard and snake skin. Well you inspired me to dig out my leather working tools. I need 2 gun holsters and a knife sheath. Good tasks for a blowy rainy day. well little by little the shop is comming along, i just orderd some tools wolfy posted a link to. thanks again wolfy. still waiting for the orther stuff i orderd. none the less the bench is comming together. Nice press. I've been wanting one forever. That'll be a nice place to pass the time. I'm sewing. Making gear for this summer. Today I sewn 4 feet with no top thread at all. It was going perfect too. LOL!!! I still want to get some punches for dressing up the sheaths. size and cut out a sheath for a 1840's style damascus hunter i had laying around. punched with a design anyway or no? i asking cause i'm getting ready to order my leather soon. Nice looking space you've created for yourself. You've give me some ideas for my own general workspace for crafting/repair/creation. Mostly it depends on what type of punching you're planning and what quality you're aiming for in your final product. If you plan to punch a basket weave on most of your work, then you can get away with more flaws in the leather. I normally go to the local Tandy shop and can inspect the hides I buy to pick out the best of whatever price range I'm buying. I normally purchase the "best" of the worst quality, but my sheathes are primarily for function and are for me or gifts for friends for users. On the few occasions I've done sheaths for pay or for knife trades (KITHs) I've purchased the best I can afford. That being said, I don't tool a lot so there is a noticeable (but irrelevant) difference between the best of the worst and the worst of the best. When ordering, if you need to pay for "selection" or "hand picked" lower quality leather and it starts to approach the cost of higher quality "unpicked" leather, I'd go for the good stuff. or some type of cover all pattern. as for my plans of what to do with my finished sheaths. sady i don'd live anywhere near a tandy store so i'll have to take my chances so to speak. Good looking set up there, Hayshaker. 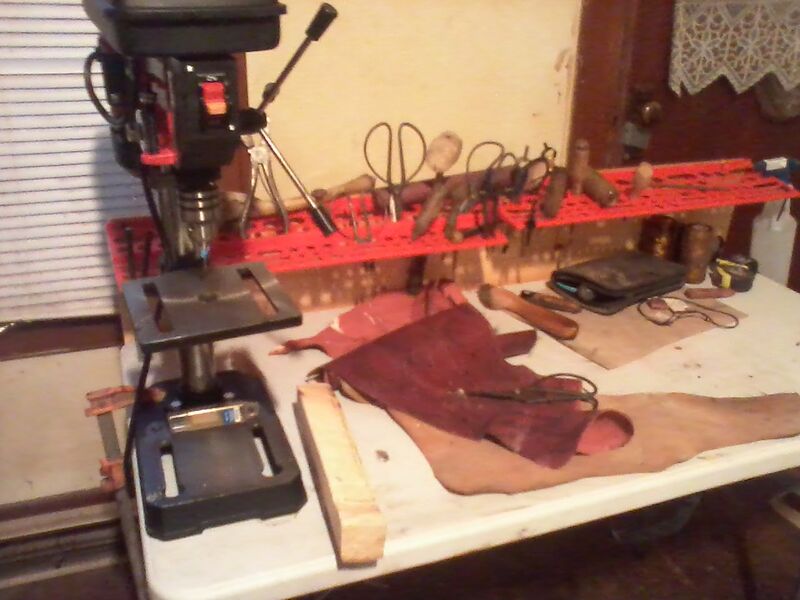 Good that you can separate the leather work area from the knifemaking area. I ruined a few pieces of leather early on trying to work on leather and a knife at the same time on the same bench. Some folks that make knives hate to make sheaths...some make don't make sheaths at all. I enjoy the leatherwork about as much as making knives. Thin spots, creases and such are the main things to avoid, of course holes lol. I'm not a fan of Tandy. Once upon a time it was probably a great company. That doesn't seem to be the case today. Last time I was in a store, there wasn't a proper harness needle to be had, not even a decent thread. Glad to see your progress! To me, it?s addicting. I wish I had the time to play with leather some more. I know your internet speed isn?t what you want, but if you can view videos on YouTube, I highly recommend watching Nigel Armitage and his stitching topic videos. Another is Ian Atkinson and his detailed project videos. Both will help and inspire at the same time. 2x4ft table creating a L shaped work area. last night i cut out 2,templates one was like the one sarge did. Heck no. I don't mind. Sorry I can't help with the buffalo hide question. I've only ever used leather from Tandy and a couple pieces recently from Hobby Lobby. Sure, the raw buffalo hide will work.....the native Americans used it almost exclusively for sheathmaking. Rawhide makes great sheath material.....almost any museum that includes sheathes from the era of the mountain men, Indians, buffalo hunters and cowboys show prime examples. Think of it as Kydex, or maybe more appropriately, Hidex......get it? .....hide, Hidex? I see what you did there, wolfy! Sounds better than nature's kydex Wolfy. I wouldn't cut up something that is a better thing as is just to get at some material. Not now anyway. In hind sight such things were never worth it. Without seeing it I gotta ask- why not neetsfoot it or whatever else you might need to do and get a rug out of it? HS, since you were asking about tanning a cow hide, you might want to look into the thing they call half-tan. To make bark tanned leather can take a very long time(to me) like up to six months-maybe more. Half-tan ~ 1/2 that time. But probably more like 1-2 months. it makes quite the superior sheath material- bark-tan leather on the outside/ rawhide in the middle. Takes to wet forming very well, carving and stamping. The real bonus is it's tough as hell to cut through or puncture when dry. Mikey, here's a good video with some excellent advice on working with Hidex, plus......I like the cut of this ol' dude's gib. Several videos out there you can learn from faster than books. your library will have several books to pick from. and can's nuttin it seems, my glasses are scratched so bad. won't be till nezt week i get them. so for now i'm wearing a jewlers visor from the shop so i can post.